How can I make derivatives with several variables? 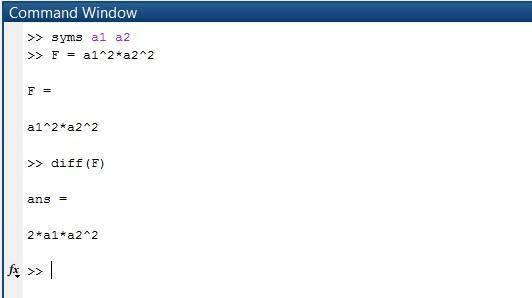 what is the correct way to say matlab which are my variables? Thank you very much I wait for your answer. You can use gradient() to find the diff(), and you could sum() the result. In this case the last Graphic Interphase exported the data and I need to derive with variables "d1", "d2" and "t1". That's difficult because the ecuation it's different each time. gradient() automatically takes the derivative with respect to each of the unbound variables in the expression. Since you are adding them all together and symbolic addition is commutative, you do not even need to know what order of variables it used. You can use symvar() to detect which variables were used in an expression, if you need to. when I tryed with gradient () matlab took all varibles. Are there some way to say to matlab which of my simbolic variables takes like varibles? For example in a ecuation I have "d1", "t1" and "d2", I need to derivate at one time but I need to derivate only about "t1" and "d2", I want "d1" like a constant. Create a vector with all of the constant names ahead of time. Then for each equation, symvar() and setdiff() against the list of constants. Ok, I am learning but I don't understand how can I do derivatives, I try this. 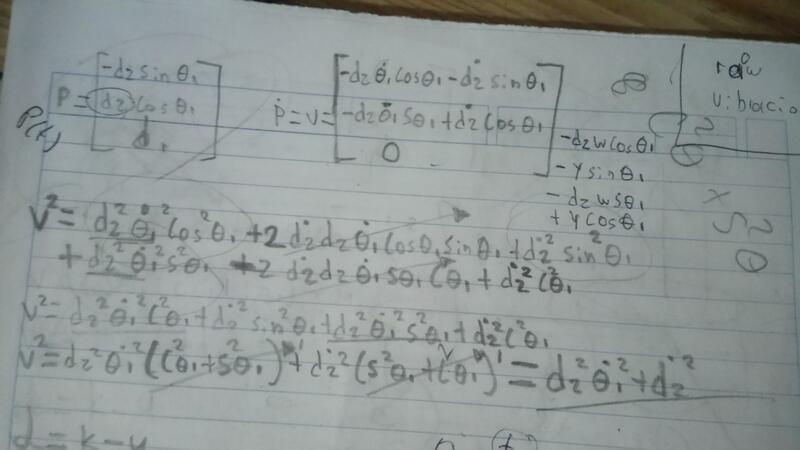 I have a position vector and I need to derive and get vector speed, but I need to appear it notation for the first derivative, second derivative, etc. You can use pretty(), or you can use LiveScript . I try to use pretty () but matlab show a error. but this is the problema I fill in with this ecuation. But then you would have to display the latex stored in BL somehow. You cannot get the graphical format you want to store into a variable. That format is a graphical format that is not how MATLAB represents symbolic expressions internally. 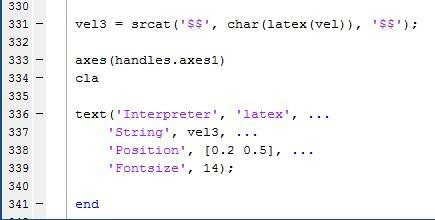 You can render into latex like I show, but the result is a character vector that cannot be operated on symbolically. How can I get the shorter from a ecuation? I try to use "simplify" but I don't get the shorter form. I found "simple" but I don't know how can I use it. What is in your vel variable, and what shorter form are you expecting? I try to simplifly this ecuation but when I use "simplify" Matlab give me the same result. I simplified in my notebook, I got this result. Nope. You have made a mistake somewhere, or else your notebook is wrong. I want to simplify with variables not with numbers, this is my notebook. In picture we can see "P" is a position vector, we need to derive to get speed vector "V" and we need to raise the square vector and simplify. "I want to simplify with variables not with numbers, this is my notebook." If you substitute specific numeric values into both forms, and you do not get the same result, then one of the two forms must be wrong. ok I am goin to check my notebook but could you help me how to displayed some ecuation in Latex form in an axes? It is a bit difficult to interpret your notebook, as you go from column vector to v^2 equation without intermediate form showing how v was derived. Your v^2 appears to be calculated by squaring the individual components of the column vector and summing those. Your vel2 term, on the other hand, is calculated by summing the elements in the column vector and squaring the result. Thus, vel2 has cross-product terms in it where v^2 does not. I can't show ecuation, I modified the code like this. In where part of yur code I can send the result to axes1?. 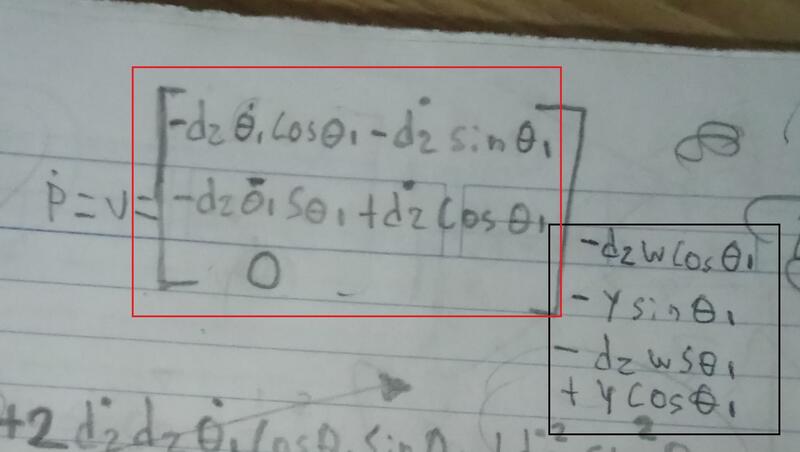 I was cheking my notebook and I found two things that I forget tell you, firstly "t1" and "d2" are variables in time, "d1" is variable but for derivate is constant, don't worry for that I already fix the code with "if" for that. Second thing I have "P" then I derive and I get "V", in this vector I square the terms and then add them after I simplify the ecuation with trigonometric identities and I get the result as you can see in the notebook. I need full code to look at this. It is not worth my time to try to piece together what your code might be. What content should be expected in handles.tabla1 ? What values should I expect for global Px Py Pz gdl ? What is stored in handles.arti1 ? What is stored in handles.arti2 ? What is stored in handles.arti3 ? The code uses them as if they are expected to be uicontrol edit that hold character vectors that represent numbers such as 2, but only value similar to that in your interface is the control for GDL, which is already used for other things. "Second thing I have "P" then I derive and I get "V", in this vector I square the terms and then add them after I simplify the ecuation with trigonometric identities"
You do not do that anywhere in your posted code. You have vel2 = vel^2 which is squaring whatever terms are already in vel, but you do not add anything to vel2 afterwards so you cannot be referring to vel2 when you say "and add them after"
which calculates some terms and then adds them. When you then square vel later, that will be squaring the sum of terms, not squaring the terms and then summing the squares. Your notebook is as if you square individual terms and then sum them squares. That is not what you appear to have implemented. It is too much information, "Px", "Py" and "Pz" come from another GUI with another analysis, "art1" and "art2" come from the options of the "radio buttom", the table is created according to GLD, if GLD is 1 it only creates a cell, if it is 2 it creates a vector [2,1] if it is 3 it creates a vector [3,1]. That's why the "if"
But all that is already done, really what I need is to show the result in a better way, that is why I intend to do it with the axis and Latex. I also need to reduce the equation. For the equation, the "P" of the notebook that is [Px; Py; Pz] to optimize time what I do is add them, then derive the vector "P" with respect to the variables entered in the table1 the rest will be constant as is the case of "d1" to get "V" that would be "vel", then I raise to the square and I have vel2 but I need to simplify it to the maximum since after I replace vel2 in the second law of newton and I generate the equation of LaGrange and I derive partially to obtain the final result. All this is a robotic analysis but I try to ask directly the problem as easy as possible I adapt the rest. "to optimize time what I do is add them, then derive the vector "P" [...] then I raise to the square"
Yes, that is what the code does. However, that is not the calculation you made in the notebook. The notebook raises each to the square and then adds them. Suppose the two entries were sin(t1) and cos(t1) . Then your notebook would do sin(t1)^2 + cos(t1)^2 and then uses the trig identity to reduce that to 1 . But your code does sin(t1)+cos(t1) and squares that, (sin(t1) + cos(t1))^2 . 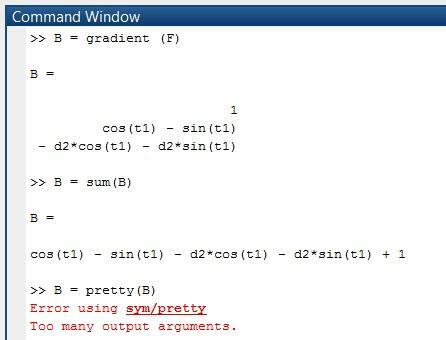 Trig identities would simplify that to sin(2*t1) + 1, not the 1 your notebook would expect. I understand the point, but I get the same vector "V". we need to change "w" and "y". Itis the same vector but when when I trying to square and simplify I do not get the same result and matlab does not simplify just put parentheses and squares. 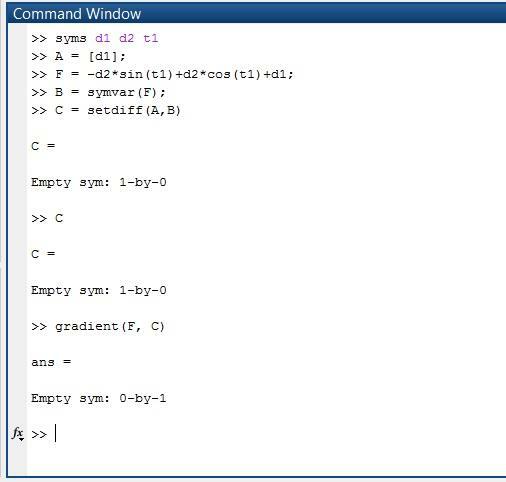 The problem is that matlab does not simplify just put parentheses and squares. "I understand the point, but I get the same vector "V"." You get the same vector under what conditions? "The problem is that matlab does not simplify just put parentheses and squares." The answer is d_2^2*theta_1_dot^2 + d_2_dot^2 . Which means that simplify() is able to do the trig simplifications when it is given appropriate input to do so. Ok I understand, how can I find my error? Could you remind me again how the variables you use in your code map to d_2 d_2_dot theta_1 theta_1_dot ? when I use gradient (), I get a vector, [1,1] is the partial derivative of a variable, [2,1] is the partial derivative of another variable, this depend on the number of variables and GDL (Degrees of freedom) in this case GDL is 2 then we check the case whith "if GDL == 2 " therefore I get each position of vector and multiply for "w" if joint is rotate or cylindrical ("radio buttoms", art1 with value (1 or 3) y art2 with value (1 or 3)) and if joint is prismatic I multiply the position of vector by "y" (art1 with value (2), art2 with value (2)). this is the simplified code for one case "GDL == 2" when I multiply variables. 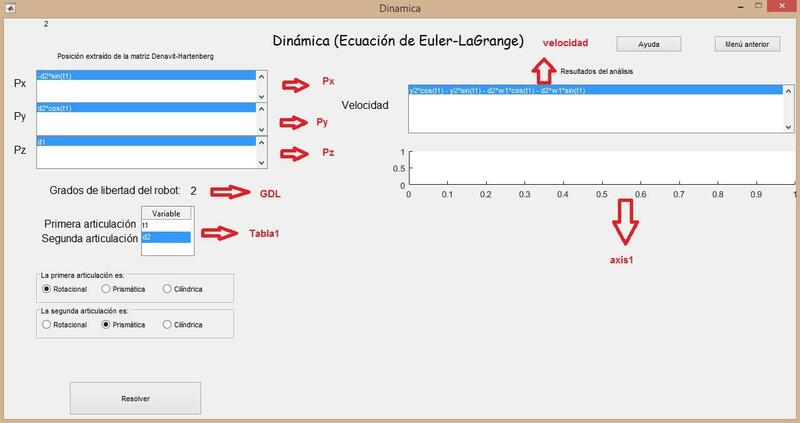 thanks my friend, I find the error you were right, I derivate the vector then square it, finally I use sum() and simplify then I get the result, sorry for a lot of question, this is my proyect to get my degree but I know about robotics but not about matlab and I am learning.